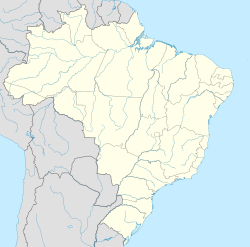 Itu is an historic municipality in the state of São Paulo in Brazil. It is part of the Metropolitan Region of Sorocaba. The population is 167,095 (2015 est.) in an area of 640.72 km². The elevation is 583 m. This place name comes from the Tupi language, meaning big waterfall. Two rivers flow through Itu: Tietê and Jundiaí. Itu has five hospitals, eleven bank agencies and one shopping center, the Plaza Shopping Itu. Itu was founded by the Portuguese in 1610 by Domingos Fernandes. It became a parish in 1653. In 1657, it was elevated to a town and municipality. It became a part of Brazil in 1822. It became a city in 1843. Its climate is subtropical, temperatures varies from 16° and 22°. The summer is warm and dry, and the winters are moderately cold and dry. It is located between the crystalline plateau and sedimentary areas. According to the 2000 IBGE Census, the population was 136,366, of which 123,942 are urban and 11,424 are rural. The average life expectancy was 71.53 years. The literacy rate was at 92.53%. Itu was the birthplace of nationally-known comedian Simplicio, whose catchphrase was "back home in Itu everything is bigger". This led to the city becoming known as the "capital of large things", with a number of oversized objects being constructed there. The town's "exaggerations" include a 4m tall yellow phone booth called "orelhão", an oversized street light, a giant car tire (which was set on fire) and a mast decorated with a star, claimed to be the world's tallest artificial Christmas tree. With the increase in domestic tourism the infrastructure soon developed to attract foreign visitors as well as international meetings, seminars and congress events. In 1999 and 2003 the Seventh Day Adventist Reform Movement held their international delegation session in Itu bringing people from over 80 countries to the city at each event. Giant traffic signal. Itu is known as the capital of "large things"
Giant public pay phone. Itu is known as the capital of "large things"
Itu celebrated its 400th birthday in 2010. ^ "Governo do Estado de São Paulo, Lei Complementar nº 1.241, de 8 de maio de 2014". Archived from the original on 18 October 2014. Retrieved 2015-09-29. ^ "Small Town In Brazil Cultivates Big Image". The Washington Post. 3 December 2000. ^ Curriculum Vitae Brazilian Mission to the United Nations, Retrieved on 2009-06-29.